Imagine an online platform that walks you through every step of the homebuying and selling process, a dashboard where all the resources and services needed to close a real estate transaction are at your fingertips. Nationstar Mortgage Holdings promised it would introduce such a service shortly after acquiring real estate software software firm Real Estate Digital in May 2014. A little over a year later, the publicly traded company, valued at $1.9 billion, delivered on that promise: It launched Xome, joining a handful of companies aiming to provide an end-to-end homebuying and selling experience online. Xome lets buyers search more than 80 percent of MLS-listed properties across the country, connect with an agent, acquire a loan from Nationstar Mortgage Holdings’ mortgage lending division and get title services from Nationstar’s title services wing. Agents in Xome’s referral network agree to charge buyers no more than a 2 percent commission, compared with the going rate of between 2.5 and 3 percent. Licensed as a brokerage, Xome has no agents of its own. Agents pay Xome a flat referral fee for deals they get through the platform, which vary based on home price. Xome’s concierge network is the engine that makes the 360-degree real estate transaction hum. Fifty full-time employees in Xome’s Seattle office will do nothing but help consumers and agents bring deals to fruition. The concierge network is part of the reason why agents may be willing to partner with Xome and charge a below-market commission: The network funnels “curated deals” to agents, not leads, said Xome CEO Kal Raman. See a comparison chart explaining what each hybrid brokerage model does — and does not — include. 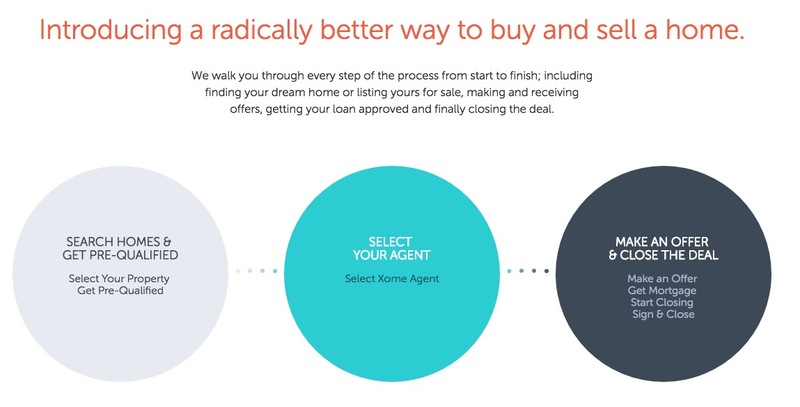 SOLOpro connects homebuyers with fee-for-service agents.